Being a North Carolina homeowner comes with great responsibility. It means keeping a running to-do task list and always checking off the jobs as they get done. 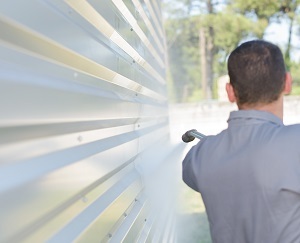 Cleaning the exterior is one of those projects that tends to get put off, usually only because the average homeowner isn't sure how to address it. The best solution is to hire a local professional for pressure cleaning in North Carolina. Some homeowners assume that they can DIY the work and rent a low grade washer from their local home improvement store. Yet the problem with this is that you are never going to be happy with the results you get. You need the more thorough, deep clean results that only true industry pros can get and here are some of the reasons why. The most obvious reason is that this will enhance your curb appeal. Whether you are getting ready to sell your home or just have ownership pride, nothing makes your exterior sparkle quite like a good pressure cleaning. It is important to rid your exterior of potentially hazardous substances and pollutants like mildew. These are contaminants that can begin to destroy your exterior surfaces. Plus, contaminants like mold can produce spores that makes their way into your home and pose a threat to the integrity of the quality of your breathing air. Cleaning your exterior is about more than just the sides of your home, it is also about walkways and your driveway. This will not only enhance the appearance it will make these areas for foot traffic safer. Removing built up algae that can be a slick slip and fall hazard will help to protect yourself and your family from injury. While there are plenty of other benefits, this should give you an idea of some of what makes it so important. The other thing to keep in mind is that you should not use the same cleaning techniques for your roof that you can use for other exterior elements. Since your rooftop is more delicate and needs special care, opt for a soft wash roof cleaning in order to take care of this aspect of your home. The other wise thing to do is make it a point to call on Taskmasters Wood Maintenance in order to get the exterior cleaning service that you want. We are a family owned and operated business that specializes in log home restoration in North Carolina, South Carolina and Virginia, and we are dedicated to providing our clients with the quality workmanship they need, including pressure cleaning. Don't take chances by settling for anyone less then the best, for your exterior cleaning work. Do you need a professional for pressure cleaning in North Carolina? Call 252-266-9457 or complete our online request form.